Three challenges that will plague Nepal’s efforts to rebuild. Nepal’s devastating earthquake last Saturday was both tragic and expected. On September 18, 2011, as colleagues and I were driving through Kathmandu, our car started to shake, buildings began to sway, store fronts cracked, hundreds of people jumped out of windows and streamed into already crowded streets. 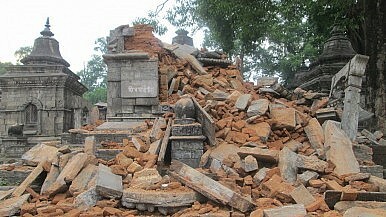 It was the so-called Sikkim earthquake. There were only a few fatalities and injuries — it was a very minor event compared to last weekend’s disaster. But it validated the rationale for our visit: to help launch a disaster relief dialogue involving U.S. government experts, Nepalese security forces, and their country’s emergency responders. The task of opening up and managing key relief routes is going to be a huge hurdle. Kathmandu’s Tribhuvan international airport survived largely intact — that’s a great plus. But it has only one runway and limited tarmac space, not nearly large enough to accommodate a huge in-flux of cargo aircraft loaded with aid supplies and requesting clearance to land. Overstressed air-traffic controllers will need continuous advice from relief experts on how best to allocate their scarce landing slots across a wide range of key relief sectors — food, water, shelter, medical services, engineering, etc. A straightforward “first come/first serve” approach for clearing flights just won’t work. Meanwhile, overland routes are highly congested as survivors head out and aid convoys head in. Staging areas with helicopter lifts for humanitarian supplies, which have already started, may help offset this to a degree. There’s no easy way to mitigate these hazards, especially for large displaced populations living under tents where heavy rains and high winds can wreak havoc. To every extent possible, flooding and landslide risk mitigation, along with rubble removal from roads and drainage systems, must be factored into the planning, construction, and management of these camps. The downfall of Nepal's prime minister can be traced to three factors.